Lichen forms when two living organisms – fungus and algae form a bond and decide to co-exist. It’s a complicated relationship, influenced by many factors. Unlike fungus, algae is capable of photosynthesizing and, as a result, provides food for both. 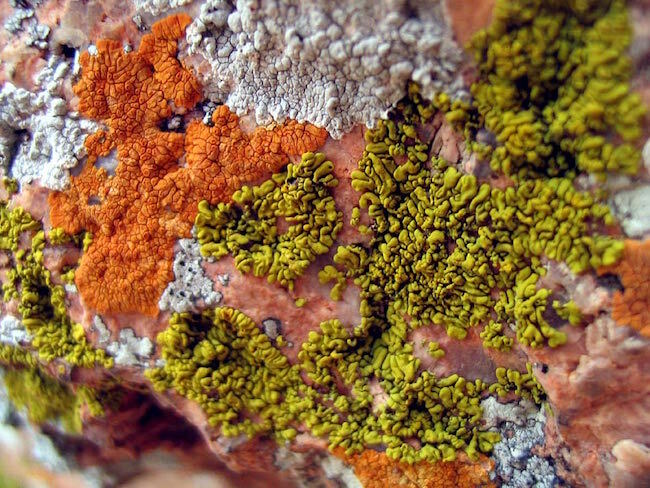 This process ultimately influences the lichen’s colour – producing a range from rich earth tones through to luscious oranges, yellows and chartreuses. Weather, moisture and sun exposure all contribute to its size, texture and palette. Estimates say that upwards of 6% of the earth’s surface is covered with 20,000 species of lichen. On summer visits to Georgian Bay I've photographed and documented lichen. In one study I colour matched PMS printing inks to a variety of lichens, knowing that the unusual colour combinations created by nature would provide an unique reference for future design projects.